Kenji Goto, a fellow journalist, died Saturday. Another innocent man beheaded by those among my co-religionists who wish to rule the world and to annihilate all non-Muslims. This in order to pave the way for an end-of-times apocalypse. Many Muslim heads hung in shame as Goto's head rolled into a barren desert ditch, while western politicians and media refused to call the Islamic State jihad what it is - a jihad. Similarly, the now-familiar masked man who kills for the camera and who beheaded Goto, was referred to by most media not as a "jihadi terrorist of the Islamic State" (which is who and what he is), but rather as "a militant with a British accent". At the official level, the Obama White House announced it will host a Feb. 18 "summit" to counter what it referred to as "violent extremism." Note the choice of words again. Not "jihadi terrorism," but the much more vague "violent extremism." Dr. Zuhdi Jasser, head of the American Islamic Forum for Democracy and a former U.S. Navy Lt. Commander, told me by not naming "jihadi terrorism" and "Islamism" for what they are, the White House has paid heed to Islamists within the administration who still exert influence over it. In a January 11 New York Times ad, several prominent moderate Muslim leaders denounced Islamism. In contrast to those who refuse to call jihadi terrorism what it is, over 20 Muslim leaders recently took out a remarkable full-page advertisement in the New York Times to denounce ISIS and Islamism. 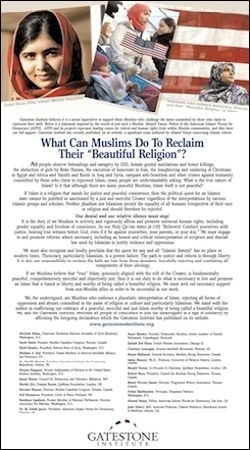 In the ad, headlined: What Can Muslims Do To Reclaim Their 'Beautiful Religion'? they wrote: "Neither jihadism nor Islamism permit the equality of all humans irrespective of their race or religion and should therefore be rejected. 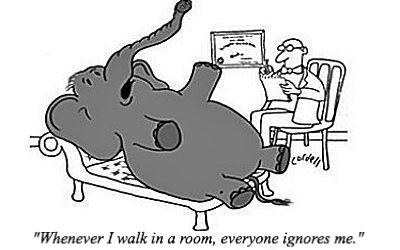 Our denial and our relative silence must stop." The American signatories, led by Dr. Jasser, also had the support of former Danish MP Naser Khedar; former Pakistan ambassador to the U.S. Hussain Haqqani, now a professor at Boston University; Toronto Sun columnist Farzana Hassan; Canadian Muslims Raheel Raza and Munir Pervaiz and Britain's leading Muslim warrior against Islamism, Majed Nawaz. They declared, "It is the duty of ... Muslims to actively and vigorously affirm and promote universal human rights, including gender equality and freedom of conscience. If Islam is a religion that stands for justice and peaceful coexistence, then the quest for an Islamic state cannot be justified as sanctioned by a just and merciful Creator." In a stirring challenge to ordinary Muslims, their New York Times ad went on to say: "We must also recognize and loudly proclaim that the quest for any and all 'Islamic State(s)' has no place in modern times. Theocracy, particularly Islamism, is a proven failure. The path to justice and reform is through liberty." Instead of engaging with these progressive Muslims and supporting their call for reform, not only did the White House ignore them, but every media outlet I saw other than Fox News did as well. As if to reinforce the blindfold the Obama administration wears on these matters, we also learned from Eric Schultz, the White House deputy press secretary, that the the U.S. government no longer considers the Taliban as a "jihadi terrorist" group, but rather as an "armed insurgency".